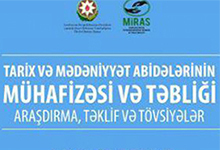 On 15th October, 2015 at 11.am MIRAS Social Organization in Support of Studying of Cultural Heritage held a presentation of final report on inclusive tour and project outcomes offered within the project, Book of Results, Proposals and Recommendations of the project “Tourism perspectives of archaeological monuments and support to disabled rehabilitation” at Azerbaijan State University of Culture and Art. On 8-9 September, 2015 IX. International Symposium of Turkic Culture, Art and Protection of Cultural Heritage/Art Activity was co-organized by Selçuk University of Turkey, MIRAS Social Organization in Support of Studying of Cultural Heritage, Azerbaijan and the University of Verona in the city of Verona. On 2-5 September, 2015 there was held XXI annual meeting of European Association of Archaeologists in Glasgow city of UK. More than 1800 archaeologists participated at the meeting from different continents of the world. The training-seminar was held on 28 August, 2015 in Agsu city within the project “Tourism Perspectives of Archaeological Monuments and Support to Disabled Rehabilitation” in school-lyceum No. 1 of Agsu City”. In the training the guests were chairperson of GÜLSAM Public Union in Support to Disabled Rehabilitation, Gulnara Salimova, head of ARABAÇI TV, Ilham Maharramov and its correspondent Amid Hasanguliyev. Chairman of MIRAS Social Organization, PhD Fariz Khalilli gave short information on 5-year activity of MIRAS and the realized projects. On 24 August, 2015 such an event was held in the hall of Shamakhi region Education Department for the region community and intellectuals for the first time. 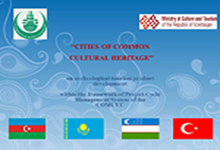 On 22-27 August 2015 studies were held in 100 facilities and 135 people were surveyed in Agsu, Shamakhi, Ismayilli regions within a project “Tourism perspectives of archaeological monuments and support to disabled rehabilitation” funded by Council on State Support to NGOs under the auspices of the President of the Republic of Azerbaijan by MIRAS Social Organization in Support of Studying of Cultural Heritage. The first phase of the project included collection of information about the regions, while the second stage the surveys among executive power in the regions, centers for labor and social protection of population, hospitals, clinics, cultural and tourism facilities, non-governmental organizations, public associations and societies, and disabled people and the general population.